About 30 students in the vocal and jazz ensembles kicked off spring break on a high note by performing in the Big Apple! 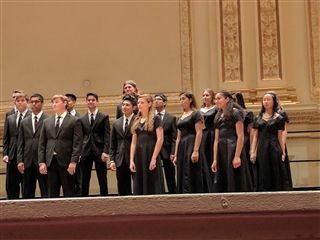 The Vocal Ensemble was chosen for the prestigious opportunity to perform a solo as part of the National Youth Choir at Carnegie Hall on April 2. Earlier, the Jazz Rock Ensemble was awarded gold at the WorldStrides Heritage Festival for their performance March 31 at Riverside Church. While it was a weekend full of choir and jazz, students also managed to soak in the city. They saw the Empire State Building, Central Park, Rockefeller Plaza, the Statue of Liberty and even two Broadway shows!